In any household, the washing machine is one object that gets a lot of use. Without clean clothes, it would be difficult to be presentable at work, school or on a date. Showing up to soccer or football practice with a dirty or smelly uniform can also be awkward. While almost everyone uses a washer and dryer, many may be unaware of how to do so in a manner that conserves water and electricity. One of the easiest energy saving tips for washing machine to implement is to fill it to an optimal volume. The manual that comes with the machine should tell you how much it can hold and clean in an efficient manner. When you don't fill the machine enough, you have to do extra loads, which means that you use more water and electricity. When you put too many items in, it may take multiple loads to clean those items properly. Buying a Maytag washing machine can be ideal for those who are looking to get their clothes washed and dried without running up a large water and electric bill. They offer a variety of energy and water saving washing machines that can make doing the laundry easy and affordable at the same time. In some cases, the machines will actually have the ENERGY STAR label on them or otherwise advertise the fact that they use less energy. If you are looking to save when drying your clothes as well, choose Maytag manual dryer over other options. You can research different washer and dryer options by going directly to a manufacturer's website or by talking with a salesperson at any store where you plan to buy it. Customer reviews are also available online to get a better sense of how a machine will meet your needs and budget. Like any other appliance, a washer and dryer will need to be maintained over time to ensure that they work to their full potential. Overtime, motors and other components to a washer or dryer could burn out, get clogged or otherwise stop working properly. By repairing or replacing those items as needed, you can be sure that you are using as little water and energy as possible with each load. In some cases, you can buy a service plan that provides free service calls on an annual or semiannual basis. That ensures that your machines are looked at regularly, which can help to spot any problems before they become hard or expensive to fix. It also allows the problems to be spotted before a washer or dryer becomes a water or electricity hog. If you are in the market for a new washer or dryer, it is important that you consider all of its characteristics. 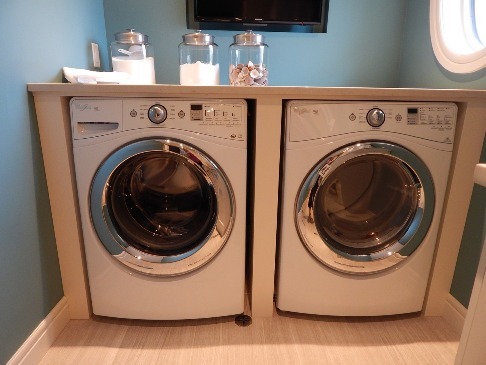 In addition to being quiet and fitting well in a laundry room or other space, it needs to be efficient enough to wash your clothes without raising your utility bills.